Rosenborg Ballklub, commonly referred to simply as Rosenborg (Urban East Norwegian: [ˈruːsn̩bɔrɡ]) or (especially locally) RBK, is a Norwegian professional football club from Trondheim that plays in the Eliteserien. The club have won a record 26 league titles, twelve Norwegian Football Cup titles and have played more UEFA matches than any other Norwegian team. RBK play their home games at the all-seater Lerkendal Stadion which has a capacity of 21,421. Eirik Horneland was appointed head coach in January 2019. The club was founded as Odd in 1917 but were not allowed to play amateur league matches until 1928, when they took the present name. They reached the League of Norway in 1937–38, but were relegated to lower divisions during the 1940s. The club moved to Lerkendal in 1957 and their first title was the 1960 Cup, resulting in their first participation in a UEFA tournament. It was not until the 1960s that RBK was established as Trondheim's leading football team. In 1967 RBK was promoted to the top league where they, except for the 1978 season, have remained ever since. They won three league titles between 1967 and 1971. The club's golden era started with the 1985 league title. From 1991 through 2004 the team won 13 consecutive titles, 10 under manager Nils Arne Eggen. During this period, they also participated in the group stage of Champions League 11 times, reaching the quarter-finals in 1996–97. On 19 May 1917, 12 young men from Rosenborg in Trondheim founded Sportsklubben Odd. The name Odd was a tribute to Odd of Skien, the most successful team in Norway at the time. Odd spent their first few years playing against other local teams before attempting to join the regional series in 1920. As with most of the "buddy" clubs formed at the time, they were repeatedly denied access. Since many of these players also played for the bigger teams, the authorities feared a possible shortage of players if too many small clubs were let in. As the years went by, disillusioned players began leaving the club, and in 1923 the first team played only a single match. By 1926, management of the club had passed on to a new generation of members, and it was through their efforts that Odd were finally admitted into the regional series in 1927, ten years after the club was founded. A year later they were set for entry into the Football Association of Norway, but their entry was blocked as the association refused to have two member clubs with the same name. The club therefore took on its current name, Rosenborg Ballklub, on 26 October 1928. Rosenborg is a mainly residential area in Trondheim. Rosenborg enjoyed little success at first, moving constantly between the lower divisions of the regional series. Yet their performance was improving and in 1931 the team qualified for the highest level, and one year later they played in the Norwegian Cup for the first time. It was also at this time that Rosenborg started planning for a new home ground at Lerkendal, although this project was not completed until after World War II. Rosenborg's youth team has been one of the best in the country ever since the club was founded and an especially talented generation of youth players during the 1950s would grow up to form the basis for the first team's success in the 1960s and onwards. In 1960 Rosenborg progressed all the way to the cup final where they faced Odd, the team from which they had adopted their original name and colours from in 1917. It took a rematch to decide the winner, but Rosenborg were able to claim their first trophy. Rosenborg won the cup again in 1964. Rosenborg was promoted from the regional league to group A of the main Norwegian league in 1960. The following season the two groups of the top flight were combined into a single league of 16 teams with the teams finishing in the bottom half being relegated to the 2nd division. Rosenborg finished as number 9 out of the 16 teams and was relegated to the new 2nd division where they played from 1963 until they won promotion by winning group B in 1966. In 1967 Rosenborg was promoted to the highest level in Norwegian football, the Main League (later the 1st Division) for the first time. This would prove to be a highly successful year for the club. Led on by such players as Harald Sunde, Nils Arne Eggen, and the talented young forward Odd Iversen, Rosenborg won their first league title. Iversen scored 17 goals in 18 matches that year, and would go on to score a massive 30 goals in the following season, although he alone could not prevent Rosenborg from being beaten to the title by Lyn. By the end of the 1960s it was clear that Rosenborg had emerged as one of Norway's leading football clubs. The 1960s saw Rosenborg venture onto the European stage for the first time. As winners of the cup in 1964, the club debuted in the Cup Winners' Cup the following year. Three years later, Rosenborg entered the European Cup as winners of the league. Rosenborg hired Englishman George Curtis as coach ahead of the 1969 season. Curtis introduced the new 4–4–2 formation and shifted focus towards tactics and organization rather than all-out attacking football. This move worked well to begin with, as Rosenborg were crowned league winners for the third time. However, when both Odd Iversen and Harald Sunde left the club, Rosenborg virtually stopped scoring goals and failed to win again in 1970. Curtis was criticized for being too defensively minded and was replaced by recently retired player Nils Arne Eggen, who reverted to a more crowd-pleasing style of play. Eggen's first of five tenures as coach was a resounding success; Rosenborg won The Double. The double-win in 1971 marked the end of the club's first golden age. Rosenborg lost the cup final two years in a row and began to struggle in the league. A flurry of coaches (including Eggen) came and went without making an impact and in 1977 the team won only one match the entire season, finishing dead last. Nils Arne Eggen was then called in for his third tenure, from 1978 to 1982, and with the return of the now 35-year-old Odd Iversen, Rosenborg climbed back into the 1st Division the following year. In 1979, Iversen became top goalscorer for the fourth time in his career, but by the time he had retired in 1982, the club had still not regained its former glory. That would finally happen in 1985 when, after 14 trophyless years, Rosenborg defeated Lillestrøm in the final match of the season to win the league by a single point. The year 1985 may have been a turning point in Rosenborg's fortunes, but it was in 1988 that things really started to happen. The club received fresh capital from its new main sponsor and was fully professionalized. Nils Arne Eggen returned to Trondheim to once again become head coach, this after leading Moss to the league title in 1987. In the waning years of the 1980s, the club secured double-wins twice, in 1988 and 1990. Rosenborg went on to dominate Norwegian club football throughout the 1990s. In strong contrast to the Norwegian national team's defensive and often criticized (yet highly effective) style of play at the time, Rosenborg achieved success through strict adherence to crowd-pleasing, attacking football. The Norwegian Premier League, established in 1991, was won 13 times in a row from 1992 onwards. The Norwegian Cup was won five times. In 1995, Rosenborg qualified for the UEFA Champions League for the first time, a feat which helped secure the club's finances and further cement its dominance at the domestic level. The income provided through successive qualifications has allowed Rosenborg to become by far the wealthiest club in Norway. Always able to offer the most promising new players better terms than their opponents, as well as the prospect of playing in Europe, Rosenborg were assured of future league championships and European qualifications. During this period, few clubs were ever able to mount a serious challenge for more than a season at a time. Rosenborg participated in the group phase of the Champions League 11 times in the 13 years between 1995 and 2007. Eight of them were consecutive (from 1995 to 2002), which was a record until 2004, when Manchester United qualified for the group phase for a ninth successive year. Rosenborg have on two occasions managed to progress beyond the first group stage of the Champions League. In the 1996–97 season, they were heading for an early exit, but with Milan squandering valuable points, the stage was set for a deciding match at San Siro. Rosenborg defeated Milan 2–1, ousting the Italians and putting themselves in the quarter-finals, where they lost 3–1 on aggregate against Juventus. In the 1999–2000 season, Rosenborg won their group to secure a place in the second group stage. The most memorable game was away against Borussia Dortmund, who were defeated 3–0. Other highlights include the 2–0 win against Real Madrid and a 5–1 victory over Olympiacos, both in the 1997–98 season. There have also been some dismal performances, particularly against French teams. 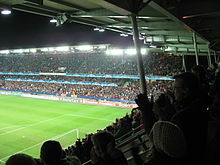 Rosenborg lost 0–5 to Lyon in 2002 and were crushed 2–7 by Paris Saint-Germain in 2000. The Norwegians failed to qualify in 2003, losing out to Deportivo La Coruña, but managed to qualify again in 2004 after beating Maccabi Haifa, and in 2005 – despite the disappointing season – they qualified for the tenth time after winning 4–3 against Steaua București. Rosenborg managed to qualify for the 11th time in 2007. The club impressed with a 1–1 draw away against Chelsea and beating Valencia 2–0 both home and away. In July 2009, Rosenborg was eliminated from the UEFA Europa League in the second qualifying round against Qarabag of Azerbaijan. A year later, in August 2010, Rosenborg were eliminated in the UEFA Champions League in the play-off round, after a 2–2 draw against Danish side Copenhagen, with Copenhagen qualifying due to the away goals rule. At the end of 2002 Rosenborg saw the retirement of Nils Arne Eggen after many successful years, during which he was only relieved once, in the 1998 season, by his assistant, Trond Sollied. Eggen was replaced by Åge Hareide, who had previously led both Helsingborg and Brøndby to championships in their respective leagues. Hareide asserted that in order to not only stay ahead at the domestic level, but also perform better at the European level, Rosenborg would have to become more cynical and focus more on defensive skill, while still maintaining the offensive play that had made the team so strong in the first place. The new manager also highlighted the need to renew the aging squad, whose continuity had been another key to the club's success; many of the players had been in the club since the start of the 1990s. In a controversial move, Hareide began this process by releasing the popular Bent Skammelsrud, who subsequently retired. Under new leadership, Rosenborg laid waste to the league, losing only three games and winning 14 points ahead of runners-up Bodø/Glimt. The club claimed its seventh Double, again defeating Bodø/Glimt in the cup final. Despite failing to qualify for the Champions League, Rosenborg had enjoyed another great season and it looked like Hareide's beginning reforms were paying off, but 2003 turned out to be his one and only season at the club as he accepted an offer to lead the Norwegian national team in December of that year. He was replaced by his assistant Ola By Rise, a notable former goalkeeper and goalkeeping coach at the club. With Hareide's unexpected departure at the end of 2003 the club failed to properly execute the reforms he had begun. It also became clear that with the increased flow of capital into Norwegian football, some clubs were finally beginning to perform at a more consistent level close, or even equal, to that of Rosenborg. Rosenborg were no longer able to dominate every match, instead taking on the appearance of a team fed up with success. Rosenborg were league winners again in 2004 but it was only through more scored goals that they were able claim the title. Ola By Rise's contract was terminated in October, even though he succeeded in leading the team to the Champions League, and for some time it was uncertain who would take over. In November the club announced the return of Nils Arne Eggen as a sort of advisor to former assistant manager, Per Joar Hansen, who was promoted to manager. Bjørn Hansen and Rune Skarsfjord would also act as assistant managers. The scheme proved so unsuccessful that Rosenborg's 2005 season was for the most part a disaster. The club battled to avoid falling into the relegation zone for much of the season, Eggen left his role midways, and Per Joar Hansen left, probably under pressure, in August. Per-Mathias Høgmo followed Hansen as the club's manager immediately after his departure. His first months were marred by a series of embarrassing losses and an early exit from the cup, but with a late-season return to form the team held on to its place in the top flight and finishing third in the Champions League Group Stage, qualifying them for the UEFA Cup. Rosenborg's woes continued in the spring of 2006. Halfway through the season, rival Brann held a commanding 10-point lead. On 27 July, Per-Mathias Høgmo went on sick leave, citing burn-out as the cause. Assistant manager Knut Tørum took up the reins. For the third time in three years, an assistant would take the helm. This time, however, it was a complete success. Rosenborg won eight straight games, gobbling up Brann's lead, and finally overtaking them. On 22 October, in what was described as "the biggest clash since the Battle of Stiklestad". Rosenborg defeated Brann away, giving the club a six-point lead with two rounds to go. The following weekend, Rosenborg defeated Viking, securing the club's 20th league title. On 31 October, Per-Mathias Høgmo ended prolonged speculation on whether he would return and in what role, when he held a press conference where he stated that he resigned as manager with immediate effect, and would withdraw from football altogether. Tørum accepted an offer to be the permanent manager. Another resignation came on 11 February 2007, when director Rune Bratseth announced his resignation, citing among other things huge pressure from the media as his reason to resign. He was replaced by Knut Thorbjørn Eggen, son of former manager Nils Arne Eggen, from 1 August. Despite the good result in 2006, manager Knut Tørum wasn't able to gain the same success in the 2007 season. That, together with his troubles to get along with director Knut Thorbjørn Eggen resulted in his resignation on 25 October 2007. Assistant manager Trond Henriksen took charge of the club for the remainder of the 2007 season. Rosenborg finished the season in 5th place. After Tørum's resignation, Rosenborg started negotiating with Trond Sollied to fill the head coach vacancy. Sollied, who since his departure in 1998 had become a merited coach in Belgium, had earlier been linked back to Rosenborg at several occasions. After a lengthy process Sollied turned down the job, giving ammunition to those criticizing the way in which Rosenborg has dealt with their recurring head coach issue in the latter years. On 28 December, Rosenborg announced Erik Hamrén as their new coach for the 2008 season. Hamrén started as coach in Rosenborg on 1 June 2008, after he had fulfilled his duties as coach for Aalborg BK. Days before Hamren's arrival Knut Thorbjørn Eggen announced his immediate resignation. The media speculated Eggen's resignation had been demanded by Hamrén in order to gain total control over the club. At 27 July 2008, Rosenborg became the first Norwegian team ever to win a final match in the UEFA Intertoto Cup, beating Dutch team NAC Breda 2–1 on aggregate. The win put RBK in the 2nd Qualifying Round of the 2008–09 UEFA Cup, where they advanced to the Group Stage. They did not win the Intertoto Cup, however; under rules instituted for the 2006 competition, the trophy is awarded to the Intertoto Cup club that advances farthest in the UEFA Cup. In the group stage Rosenborg failed to impress, finishing last with two points. The club also failed in the League, finishing at a disappointing 5th place, for the second year in a row. In front of the 2009 season Hamrén brought several new players to Rosenborg, one of them being Rade Prica, who Hamrén knew well from Aalborg. At the end of the season, Rosenborg won the league with 69 points, 13 points ahead of the nearest rival Molde FK. Rosenborg lost only one league game, a 3–2 loss against IK Start. Rosenborg had their run for taking the double stopped by Molde in the cup's quarter final, losing 5–0. The club got their revenge in late September, when they defeated Molde in the league and by that secured their 21st league title. On 20 May 2010 it was decided that Nils Arne Eggen would lead Rosenborg out the 2010 season. He took over after Erik Hamrén who went to be the Manager for the national team of Sweden. Erik Hamréns last match was a 2–1 away win against Viking FK on 24 May. On 24 October 2010, Rosenborg won the league for the 22nd time after winning 1–0 over Tromsø IL. 7 November, Rosenborg played the last league game of season against Aalesund who ended in a 2–2 draw, which meant that they went unbeaten all season in the league-competition. Jan Jönsson, whose contract with Stabæk ended after the 2010 season, was hired as head coach ahead of the 2011 season and he led the team for two seasons, where Rosenborg finishing third in the league and qualified for the Europe League group stage both years. However, the club was not happy with Jönsson's results as head coach and he was sacked on 7 December 2012. As a search for a new head coach, Per Joar Hansen was linked to Rosenborg, but the message was not well received from the supporters. Hansen's previous stay at Lerkendal ended poorly, and therefore many fans were skeptical of him as the replacement for Jan Jönsson. On 14 December 2012, Per Joar Hansen was confirmed as new head coach, with the ambition to take Rosenborg back to the top of the league. Hansen's first major modification was changing from Rosenborg's regular 4–4–2 to the more aggressive 4–3–3 as they played in the 90's, taking the team back to the roots. Hansen's change of formation did not become well received when Rosenborg only scored three goals in their eight pre-season matches. Anyway, after half the season finished the team impressed everyone with great progress in the Norwegian Cup, being 2nd in the league, and as expected progressing from the Europa League first qualifying round by beating Northern Irish Crusaders, 2–1 away and ending with 7–2 victory at Lerkendal. Sadly, the beginning of second half of the season shocked everyone when Rosenborg were surprisingly beaten by St Johnstone in the Europa League second qualifying round. Frazer Wright's goal earned the Scottish side a memorable 1–0 victory in Norway before fighting back from an early goal to draw 1–1 at home. This was enough to secure a 2–1 aggregate victory for St Johnstone. Rosenborg continued to gather points in the league, but was shocked when they lost to relegation threatened Tromsø in the 23 round. They finished in 2nd place only one point behind Strømsgodset, much argued because lack of performance at home field. As a positive end of the season, Rosenborg had managed to enter the Cup Final against archrival Molde. This was Rosenborg's first Cup Final since 2003, when they beat Bodø/Glimt 3–1. Unfortunately for Rosenborg, they lost the match 2–4 after leading 2–1. In June 2014, after a disappointing spring season with elimination from the Cup in the third round against Ranheim, lack of stable performance in the league and an embarrassing defeat against Sligo Rovers in the Europa League, it was decided to fire head coach Per Joar Hansen and assistant coach Bård Wiggen. Former Rosenborg player and assistant coach Kåre Ingebrigtsen was presented as temporary coach on 21 July 2014, and already sports director Erik Hoftun was presented as assistant coach. Rosenborg played poorly in the first matches with the new coach, losing three of the first four with Kåre Ingebrigsten in charge. But the team redeemed themselves by winning nine of the last ten games in the season finishing in 2nd place, eleven points behind Molde. Ingebrigtsen's great performance led to him being introduced as the new permanent coach 20 November 2014. Kåre Ingebrigsten's first major change was the amount of exercise the players should be susceptible to. He had the same vision as former coach Hansen, but the players have to be able to perform better. During the previous two season, Rosenborg had a tendency to collective collapse the last ten minutes due to exhaustion. Ingebrigtsen decided therefore that the training would be increased by 40 percent, so that players would be able to finish matches and not let easy goals get scored against. The provision gave results immediately; Rosenborg scored 23 goals and let only two against in their first five pre-season matches. The season saw Rosenborg win the title again.They made the play-off in the Europa League, beating Debrecen 3–2 in the first leg away in Hungary. As a result of Rosenborg's crowd pleasing play, the home spectator numbers increased by 31 percent from 13,922 to 18,239 on average. At the end of the season Rosenborg won their 23rd title, finishing 12 points clear ahead of the second place Strømsgodset. On November 22 Rosenborg beat Sarpsborg 08 by 2:0 in the Cup final to win their 10th national cup and complete their 8th domestic double. In 2016 Rosenborg won both the league and the cup, and by doing so because the first team in Norway to win the double two years in a row. This was Rosenborg's 9th domestic double. The founding members of Rosenborg bought their first kits in 1918. The shirts were blue with a yellow vertical stripe on the front and the shorts were white. The current white shirts and black shorts, introduced in 1931, were another tribute to the football club Odd. A shirt sponsor was introduced in 1971. Home kit: White shirt and black shorts. Away kit: Black shirt and black shorts. Third kit: Red shirt and red shorts. Rosenborg play their home matches at Lerkendal Stadion, an all-seater stadium located at Lerkendal, 3 kilometers (1.9 mi) south of the city center. It has four, three-tier grandstand without corners with a capacity for 21,421 spectators, of which 1,338 are in club seating and luxury boxes on the center tier of all four stands. The stadium is part of Lerkendal idrettspark, which also consists of three training pitches, two in full size and of which one has artificial turf. The club's offices are located in Brakka, a German-built barracks dating from World War II. Lerkendal Stadion opened on 10 August 1947 as the main athletics and football venue in Trondheim, owned by the municipality. Rosenborg took Lerkendal into use from the 1957–58 season. The first major rebuilding of the venue took place ahead of the 1962 season, when the wooden stands were torn and replaced with concrete stands on both long sides, and the south stand received a roof. Floodlighting was installed in 1968 to allow UEFA club tournament matches to be held at the venue. The official all-time record at Lerkendal is 28,569 from the 1985 season league match against Lillestrøm. After the 1995 season, the first part of the current stadium was built to allow for modern facilities for UEFA matches. The short sides were finished in 2001, and the final long stand was completed in 2002. The expansion also saw Rosenborg and private investors purchase the stadium. Updated 1 February 2019Note: Flags indicate national team as defined under FIFA eligibility rules. Players may hold more than one non-FIFA nationality. For season transfers, see transfers winter 2018–19 and transfers summer 2019. As of 26 January 2019, according to the official Rosenborg website. As of 5 March 2019, according to the official Rosenborg website. The following is a list of the all-time statistics from Rosenborg's games in the four UEFA tournaments it has participated in, as well as the overall total. The list contains the tournament, the number of games played (P), won (W), drawn (D) and lost (L). The number of goals scored (GF), goals against (GA), goal difference (GD) and the percentage of matches won (Win%). The statistics include qualification matches and is up to date as of the 2016–17 season. The statistics also include goals scored during extra time where applicable; in these games, the result given is the result at the end of extra time. The club's record win is 17–0 in a cup match against Buvik in 2003; the league record is 10–0 against Brann in 1996 and the Champions League record is 6–0 against Helsingborg in 2000. In the league, the team had a record 87–20 goal difference in 1997, claimed a record 69 points in 2009 and went undefeated in 2010. Rosenborg was relegated after the 1977 season having won just a single match. The record home attendance is 28,569 spectators at Lerkendal Stadion against Lillestrøm in 1985. Roar Strand, who played 21 seasons between 1989 and 2010, has played 644 matches, more than any other Rosenborg player. He has also won the most titles with the club, having won the league 16 times and the cup 5 times. With 256 goals, Harald Martin Brattbakk is the club's all-time top scorer and was the league's top scorer during six seasons. Sigurd Rushfeldt is the league's all-time top scorer, although he scored a majority of these for Tromsø. Odd Iversen holds the record for most goals in a single match and season, with 6 and 30 respectively. The club received its highest transfer fee for John Carew; they received 75 million Norwegian krone when he was sold to Valencia in 2000. Svardal, Geir (2007). Historien om Rosenborg Ballklub 1917–2007 (in Norwegian). Trondheim: Tapir Akademosk Forlag. ISBN 978-82-519-2188-6. ^ "Milan eliminated". The Independent. 5 December 1996. Retrieved 26 May 2012. ^ Riley, Catherine (11 December 1997). "Football: Rosenborg's dream vanishes with 89th-minute equaliser". The Independent. Retrieved 26 May 2012. ^ Berlin, Peter (21 March 1997). "For Juventus, easy victory as an era approaches its end". The New York Times. Retrieved 26 May 2012. ^ Hughes, Rob (21 October 1999). "Sorensen strikes twice as inspired Rosenborg crushes Dortmund". The New York Times. Retrieved 26 May 2012. ^ "In love with the Apprentice". FXT.no. Retrieved 2 March 2008. ^ "Hamrén as new coach". Rbk.no. Archived from the original on 3 March 2008. Retrieved 2 March 2008. ^ Budalen, Andreas (9 August 2009). "Molde ydmyket Rosenborg" (in Norwegian). NRK sport. Retrieved 13 November 2009. ^ ""Nei til Perry" og "Hoftun må gå"" (in Norwegian). Dagbladet. 12 December 2012. Retrieved 18 February 2014. ^ "Per Joar Hansen er ny RBK-trener" (in Norwegian). NRK. 14 December 2012. Retrieved 18 February 2014. ^ "Tilbake til røttene" (in Norwegian). BA. 26 January 2013. Retrieved 18 February 2014. ^ "Rosenborg vant 7–2" (in Norwegian). Trønder-Avisa. 11 July 2013. Retrieved 18 February 2014. ^ "Første RBK-tap på nesten fem måneder" (in Norwegian). Trønder-Avisa. 15 September 2013. Retrieved 18 February 2014. ^ "Mener gullet glapp hjemme" (in Norwegian). Adressa. 10 November 2013. Retrieved 19 February 2014. ^ "Molde ble cupmester" (in Norwegian). Avisa Nordland. 24 November 2013. Retrieved 19 February 2014. ^ "Bekreftet: Ingebrigtsen tar over som RBK-trener" (in Norwegian). TV2. 21 July 2014. Retrieved 24 July 2014. ^ "Ingebrigtsen: – Jeg er stolt og ydmyk" (in Norwegian). NRK. 20 November 2014. Retrieved 2 August 2015. ^ "Ingebrigtsen kritisk til norsk treningsfrykt" (in Norwegian). NRK. 22 April 2015. Retrieved 2 August 2015. ^ "Rosenborg har scoret 23 mål på fem kamper" (in Norwegian). NRK. 6 March 2015. Retrieved 2 August 2015. ^ "Map and Transport". Rosenborg BK. Archived from the original on 13 April 2011. Retrieved 13 April 2011. ^ "Fakta Stadion" (in Norwegian). Rosenborg BK. Archived from the original on 13 April 2011. Retrieved 13 April 2011. ^ "Lerkendal Idrettspark" (in Norwegian). Rosenborg BK. Archived from the original on 13 April 2011. Retrieved 13 April 2011. ^ "Trondheim får landets nest-største idrettsanlegg". Verdens Gang (in Norwegian). 9 August 1947. p. 12. ^ "Lerkendal stadion" (in Norwegian). RBK Web. Archived from the original on 12 April 2011. Retrieved 12 April 2011. ^ "For slitne for cupfinale" (in Norwegian). RBK Web. Archived from the original on 12 April 2011. Retrieved 12 April 2011. ^ "De best besøkte RBK-kampene på Lerkendal" (in Norwegian). RBK Web. Archived from the original on 12 April 2011. Retrieved 12 April 2011. ^ Stenberg, Morten (16 July 1995). "RBK truer med å spille E-cup i Oslo". Verdens Gang (in Norwegian). p. 8. ^ "Nye Lerkendal – fakta om utbyggningen" (in Norwegian). RBK Web. Archived from the original on 12 April 2011. Retrieved 12 April 2011. ^ Lein, Øyvind (12 April 2000). "Investorer til RBKs lekegrind". Adresseavisen (in Norwegian). p. 29. ^ "Rosenborg spillerstall". RBK.no. Archived from the original on 21 May 2016. Retrieved 8 May 2016. ^ "Rosenborg 2". RBK.no. Retrieved 8 July 2018. ^ "Rosenborg G19". RBK.no. Retrieved 5 March 2019. ^ "Rosenborg G16". RBK.no. Retrieved 8 July 2018. ^ Harrison, Wayne (5 April 2011). "Rosenborg BK". Union of European Football Associations. Archived from the original on 15 April 2011. Retrieved 15 April 2011. ^ a b "Rosenborg overlegne i superfinalen". Verdens Gang (in Norwegian). 7 March 2010. Archived from the original on 27 April 2011. Retrieved 27 April 2011. ^ "Lister Eliteserien 2010" (in Norwegian). Norwegian Broadcasting Corporation. 3 March 2011. Archived from the original on 15 April 2011. Retrieved 15 April 2011. ^ Harrison, Wayne (25 August 2010). "Ottesen earns København group-stage prize". Union of European Football Associations. Archived from the original on 15 April 2011. Retrieved 15 April 2011. ^ "Eliteserien 2010" (in Norwegian). Norwegian Broadcasting Corporation. Archived from the original on 15 April 2011. Retrieved 15 April 2011. ^ "Terminliste Fotball-NM, menn 2011" (in Norwegian). Norwegian Broadcasting Corporation. 6 November 2011. Archived from the original on 29 November 2011. Retrieved 29 November 2011. ^ "Eliteserien 2011" (in Norwegian). Norwegian Broadcasting Corporation. Archived from the original on 29 November 2011. Retrieved 29 November 2011. ^ "Third qualification round". Union of European Football Associations. Archived from the original on 29 November 2011. Retrieved 20 April 2011. ^ "UEFA Europa League 2011/12 – Rosenborg BK". UEFA. Retrieved 2 December 2013. ^ "Terminliste Fotball-NM, menn 2012" (in Norwegian). Norwegian Broadcasting Corporation. 27 September 2012. Archived from the original on 18 November 2012. Retrieved 18 November 2012. ^ "Eliteserien 2012" (in Norwegian). Norwegian Broadcasting Corporation. Archived from the original on 18 November 2012. Retrieved 18 November 2012. ^ "UEFA Europa League 2012/13 – Rosenborg BK". UEFA. Retrieved 18 August 2012. ^ "Terminliste Fotball-NM, menn 2013" (in Norwegian). Norwegian Broadcasting Corporation. 24 November 2013. Retrieved 1 December 2013. ^ "Eliteserien 2013" (in Norwegian). Norwegian Broadcasting Corporation. Retrieved 1 December 2013. ^ "UEFA Europa League 2013/14 – Rosenborg BK". UEFA. Retrieved 1 December 2013. ^ "Rosenborg BK". Union of European Football Associations. Archived from the original on 21 April 2011. Retrieved 20 April 2011. ^ "Rosenborg BK". Union of European Football Associations. Retrieved 22 May 2011. ^ a b Berre, Tor (18 October 2010). "Klubbrekorder" (in Norwegian). Norwegian Broadcasting Corporation. Archived from the original on 22 April 2011. Retrieved 22 April 2011. ^ a b "Eliteserien 2009" (in Norwegian). Norwegian Broadcasting Corporation. Archived from the original on 15 April 2011. Retrieved 15 April 2011. ^ a b "Eliteserien 2010" (in Norwegian). Norwegian Broadcasting Corporation. Archived from the original on 15 April 2011. Retrieved 15 April 2011. ^ Berre, Tor (7 March 2010). "Flest tilskuere" (in Norwegian). Norwegian Broadcasting Corporation. Archived from the original on 22 April 2011. Retrieved 22 April 2011. ^ Berre, Tor (25 October 2009). "Flest sesonger" (in Norwegian). Norwegian Broadcasting Corporation. Archived from the original on 22 April 2011. Retrieved 22 April 2011. ^ Berre, Tor (31 October 2010). "Flest kamper" (in Norwegian). Norwegian Broadcasting Corporation. Archived from the original on 22 April 2011. Retrieved 22 April 2011. ^ Berre, Tor (1 November 2010). "Mestvinnende" (in Norwegian). Norwegian Broadcasting Corporation. Archived from the original on 22 April 2011. Retrieved 22 April 2011. ^ Berre, Tor (25 October 2009). "Toppscorere" (in Norwegian). Norwegian Broadcasting Corporation. Archived from the original on 22 April 2011. Retrieved 22 April 2011. ^ "Gratulerer Rushfeldt" (in Norwegian). Football Association of Norway. 20 November 2011. Archived from the original on 19 May 2012. Retrieved 19 May 2012. ^ Sagbakken, Ole Kristian (2 March 2011). "90-tallet kommer aldri igjen". Adresseavisen (in Norwegian). Archived from the original on 5 February 2011. Retrieved 22 April 2011. Wikimedia Commons has media related to Rosenborg BK.